Company culture is an integral part of every business and organization. It affects nearly every aspect of the company. From selling, recruiting, and building, it’s the backbone of a positive climate. Within a positive corporate culture, many staff and agents find the real value in their work, and this leads to a variety of positive consequences for your bottom line. A company’s culture is its identity. It is how the company views itself, and how the company wishes to be viewed by the outside world. Building the culture you want is not quite as easy as you might think. Simply claiming some set of values and behaviors and plastering them on your wall won’t build your culture. You must first define them so that there is no chance for misinterpretation, and then train your people to put them to use. The Alliance, has created such a culture. In this book, we share our secret formula through the representation of a house. Our house is made up of three belief dormers: 1. Sell, Recruit, Build; 2. Have Fun, Make Money, and Make a Difference; 3. Duplication, Association, and Edification. Those beliefs are held up by our eight pillars (core values) of Excellence, Service, Integrity, Accountability, Respect, Compassion, Community, and Gratitude. We have eight steps leading up to the door of The Alliance. Those steps of: Communicate, Be Accountable, Be Teachable, Attend All Meetings, Read, Listen, Work, and Personal Use give you all access, when followed to the door of our house. When the door is opened, this allows you to cross through the threshold into Prosperity, Inspiration, and Eternity (or what we call P.I.E.). 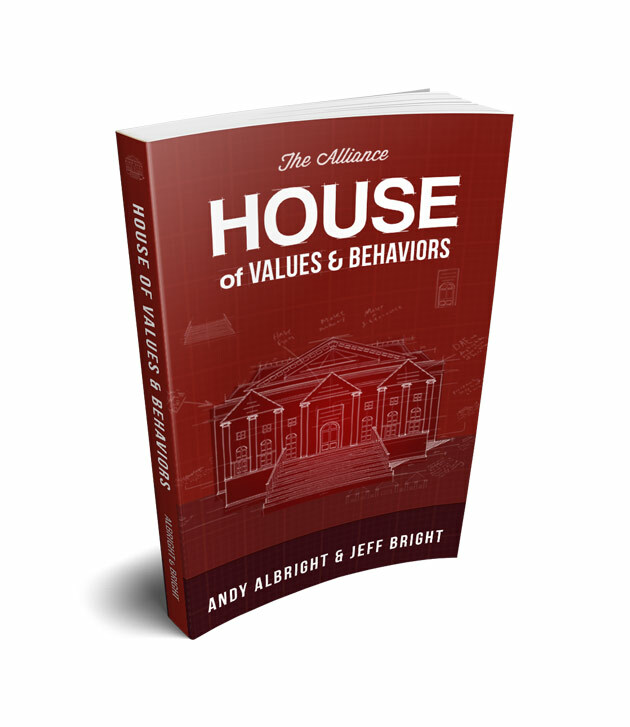 This book’s focus is on the eight core values and the four behaviors or expectations behind each pillar (for a total of 32). These 32 behaviors exist as a guide to help a person understand the expectations within each of the eight core values.